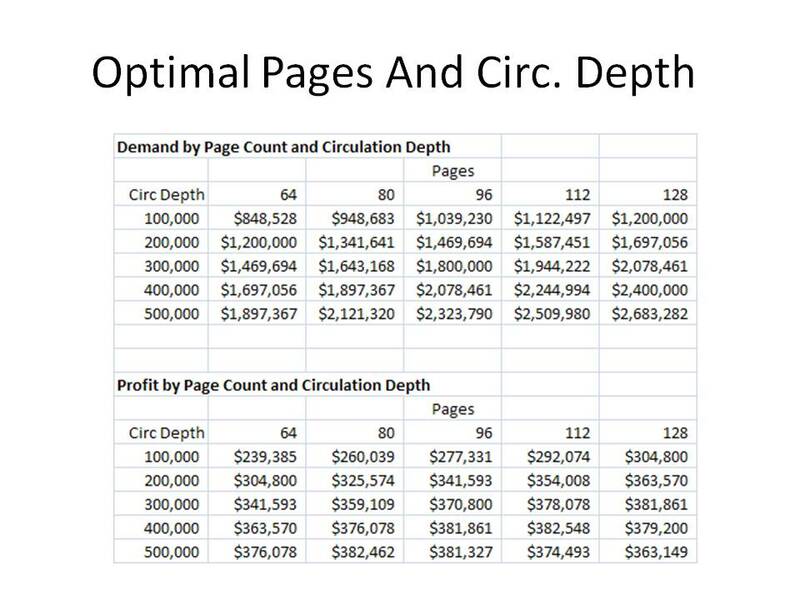 Old school catalogers spend considerable time optimizing circulation depth and pages per catalog (please click on the image for more information). There is a formula that you can use to make high-level estimates of sales performance at different circulation depths and page counts. We've talked about this previously, but it is worth mentioning again. Demand Prediction = ((Proposed Pages / Last Year Pages)^0.5) * ((Proposed Circulation Depth / Last Year Circulation Depth)^0.5) * (Last Year Demand). Many catalogers play with the (0.5) factor, testing different combinations and then fitting the appropriate factor. 80 pages to 500,000 customers. 96 pages to 500,000 customers. 112 pages to 400,000 customers. 128 pages to 300,000 customers. When you look at the four optimal combinations, what do you observe? Yup, smaller page counts allow one to contact many, many more customers. This is why you see so many companies with small prospecting catalogs. The equations were created at Eddie Bauer, way back in 1998. We used the equations to optimize page counts for each merchandise division, then rolled-up the pages, and optimized circulation depth. It was like sweeping up money, tremendous fun for a math geek, lots of profit for the company. By the way, e-mail folks ... you can run a similar exercise. But the metrics change. Circulation Depth still matters. If you have an e-mail list of 100,000 customers, you'll generate less demand mailing only the top 20,000 customers. Pages are replaced by contacts. Instead of 64/80/96 pages, you have 1/2/3 contacts per week. Using this framework, you can quantify demand by circulation depth and number of contacts.